Modern Australian architecture offers many interesting opportunities for light and open spaces by using a multitude of glass features such as large windows, glass roofs, skylights and verandas. However, too much sunlight can inhibit the full use of these areas. Varioscreen® – retractable sunroof from Helioscreen is a retractable sun protection system that allows sunlight through to your living and working environment while keeping out the blinding glare and heat. Available for flat glass roofs and pergolas, Varioscreen® gives you more flexibility and freedom to enjoy these spaces, ensuring that both the exterior appearance of the building and the view from within are not compromised. Available in translucent and mesh fabrics. Sun and wind sensor option available. As with many of our products we have a range of fabric collections to suit various needs. Below is a rough guide on how to best select a fabric for your individual needs. 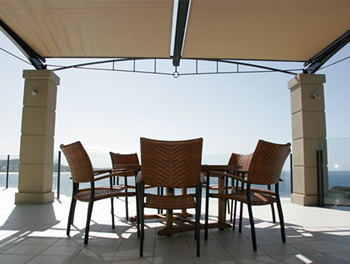 We recommend consulting with a Helioscreen Specialist before deciding on which fabric best suits your needs.